Plum Deluxe has provided me with their January Tea Club package for the purposes of providing an honest review. I received this product at no charge to me and received no other compensation. 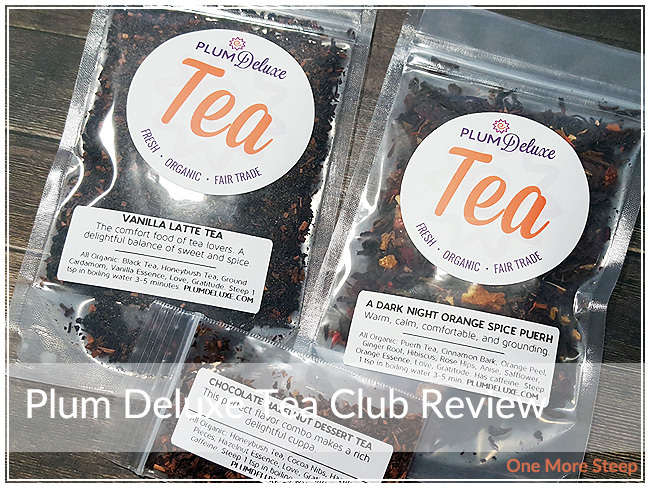 Andy Hayes of Plum Deluxe contacted me and asked if I would be interested in reviewing a monthly club package for Plum Deluxe – of course I said yes! 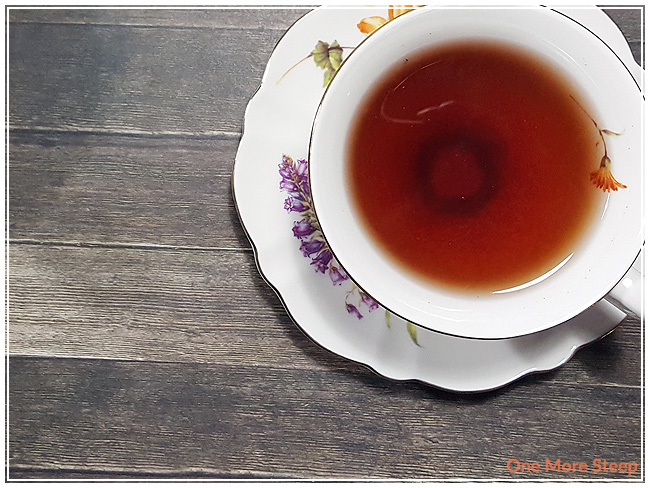 Plum Deluxe offers a monthly tea club subscription, an online shop for à la carte tea shopping, as well as an online community and blog full of tea resources. It was fun getting the January tea club shipment in the mail – I was sent the two teas option (two 1oz teas, with 1 tea sample), as well as the autumn/winter playbook for Plum Deluxe, which costs $16USD/month. 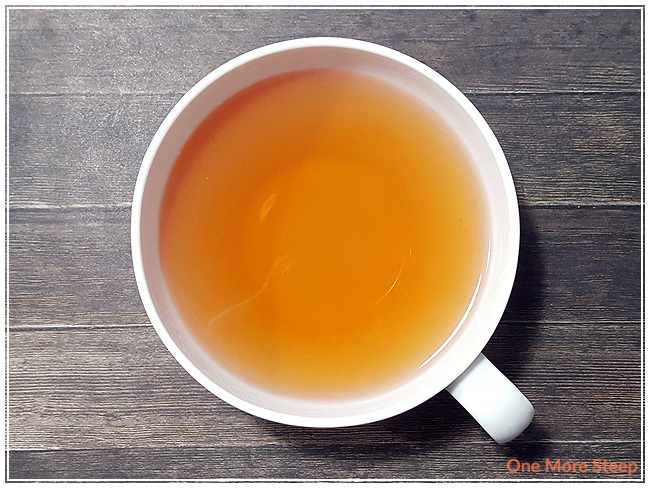 There is also a single tea option (one 1oz tea with 1 tea sample) that is $10USD/month. Subscriptions are paid for quarterly (3 months), and at the time of writing they only ship within the United States and to Canada. For Canadian tea lovers, they offer the 1 tea option of their monthly tea club subscription for $17USD/month and the 2 tea option for $23USD/month – also charged for 3 months at a time. For my package, I did get to choose one of the tea choices. Whichever option you choose (1 tea or 2), you’ll always receive the special blend of the month. If you opt for the 2 tea option, you get the 1oz of the special blend of the month, 1oz of a surprise signature blend, and 1 tea sample. I had gone through the Plum Deluxe website and Vanilla Latte had appealed to me, so Andy was kind enough to make that the ‘surprise’ signature blend for me. In this package, the teas I received were A Dark Night Orange Spice Puerh (1oz), Vanilla Latte Tea (1oz), and Chocolate Hazelnut Dessert Tea (sample). 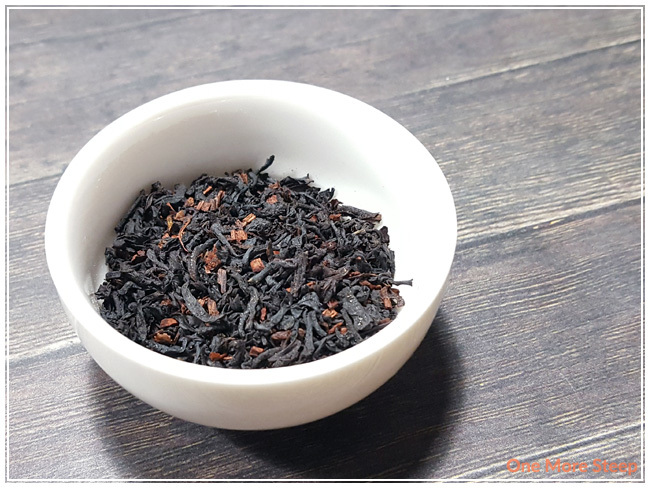 The special blend of the month is exclusive to tea club members. I was quite pleased with the packaging that Plum Deluxe has opted for. They use clear, resealable bags. It’s nice because you can easily see what the tea blend looks like, as well as how much you have left. For storage purposes, I always recommend keeping teas in a dark place – light is one of the things that can speed up tea going a bit stale or losing flavour. 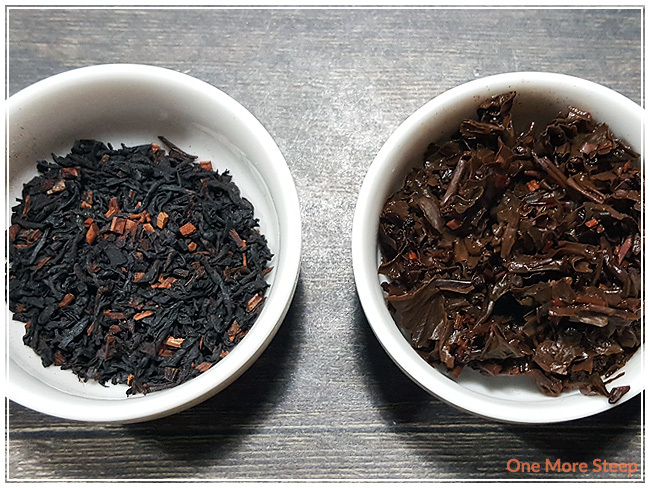 I’ll be keeping the order of each tea throughout the sections consistent – with the special January blend first (A Dark Night Orange Spice Puerh), followed by my pick (Vanilla Latte Tea), and the tea sample (Chocolate Hazelnut Dessert Tea). 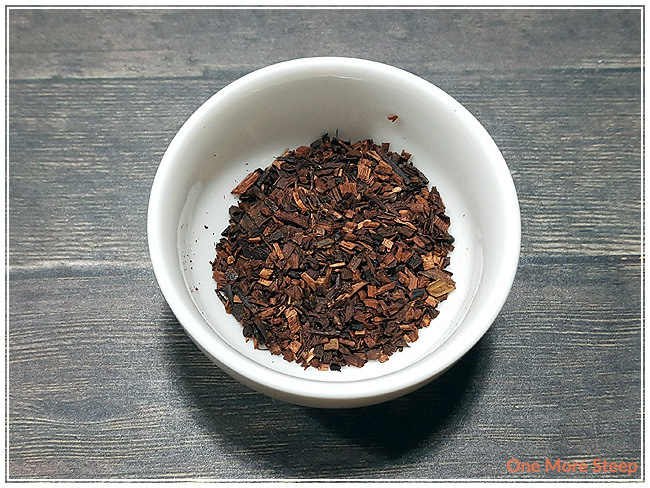 A Dark Night Orange Spice Puerh has a very strong cinnamon, orange/citrus smell in the dry leaf. I like that I can make out the ginger and anise in the tea blend. 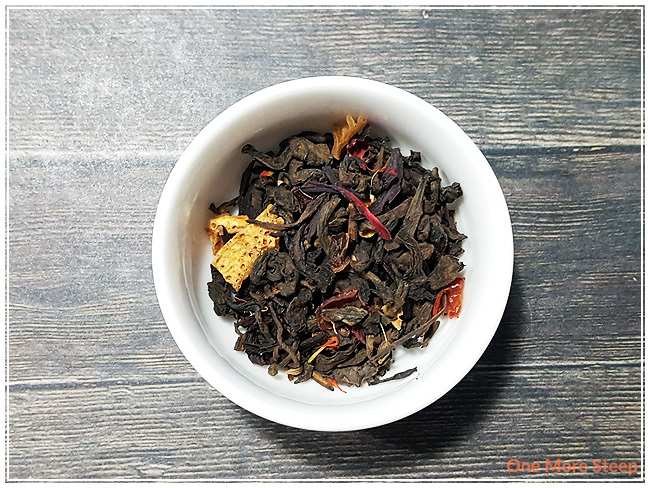 This puerh blend is made up of: puerh tea, cinnamon bark, orange peel, ginger root, hibiscus, rose hips, anise, safflower, and orange essence. Vanilla Latte Tea’s dry leaf has a honeyed smell, I can also make out the vanilla and the cardamom. The smell of Vanilla Latte Tea reminds me a lot of a vanilla birthday cake, which is quite pleasant. Vanilla Tea Latte’s ingredients are: black tea, honeybush tea, ground cardamom, and vanilla essence. Chocolate Hazelnut Dessert Tea is a cute little sample, there’s really just enough for one cup and to get a taste for it. It smells like chocolate and hazelnut, which is a winning combination in my book! I love hedgehog chocolates (which have a hazelnut filling, if you don’t know the magic of hedgehogs), and the smell of this blend remind me of the hedgehogs so much! Chocolate Hazelnut Dessert Tea is made up of: honeybush tea, cocoa nibs, hazelnut pieces, and hazelnut essence. For all three teas, Plum Deluxe recommends the same steeping instructions – to steep in boiling water (100°C/212°F) for 3 to 5 minutes. For each tea’s initial steep, I steeped them for 3 minutes. 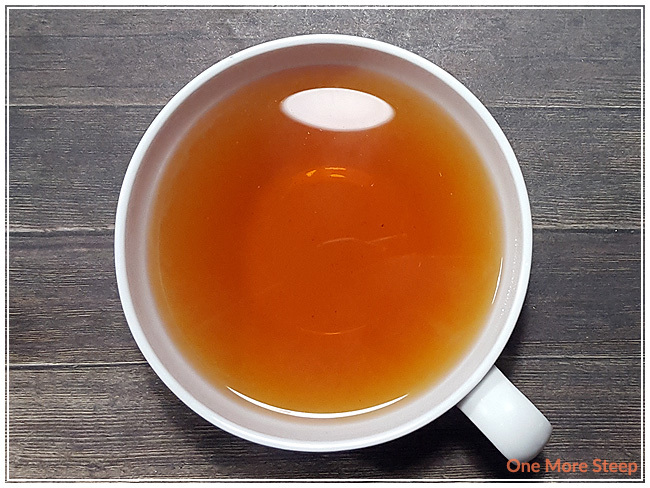 A Dark Night Orange Spice Puerh has very strong cinnamon, orange, and ginger smell to it after its steeped for 3 minutes. On first taste, I notice a mild tartness in the tea. I contribute that to the hibiscus, and it’s not off-putting. There’s a nice warming sensation that I get in my mouth and stomach when drinking this tea that is likely from the ginger and cinnamon combination. 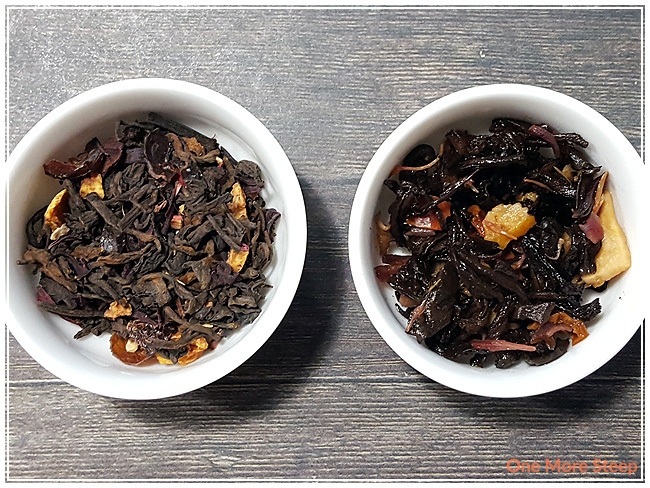 What I like is that the puerh base comes out at the end of each sip and seems to be quite unadulterated from the other ingredients – it has a nice earthiness to the tea that only a puerh can have. There’s a slight sweetness that mingles well with the tartness from the hibiscus. Vanilla Latte Tea smells like vanilla, which is quite inviting. I can smell the honeybush, which does remind me a bit of rooibos. There’s a light honeyed taste to it, I like the natural sweetness of this honeybush blend. The vanilla is quite strong in the flavour of Vanilla Latte Tea, but it lacks the creaminess that I was expecting from a tea called Vanilla Latte Tea. There is zero astringency or bitterness in this tea, which is fantastic. I can make out the cardamom flavour in each sip, and it balances really well with the honeybush flavour. I did add some milk to my cup of Vanilla Latte Tea to turn it into a latte and I think it kicks it up a notch in terms of adding the expected dairy element while not detracting from the vanilla flavour. Chocolate Hazelnut Dessert Tea has a strong honeybush smell after it has steeped. I can smell the hazelnut, and if I concentrate I can smell the chocolate. There’s a very light chocolate and hazelnut taste to this honeybush blend – I was concerned that I wouldn’t be able to taste chocolate! Because of the honeybush, this is sweet and I do not think that it needs any sweetener at all. 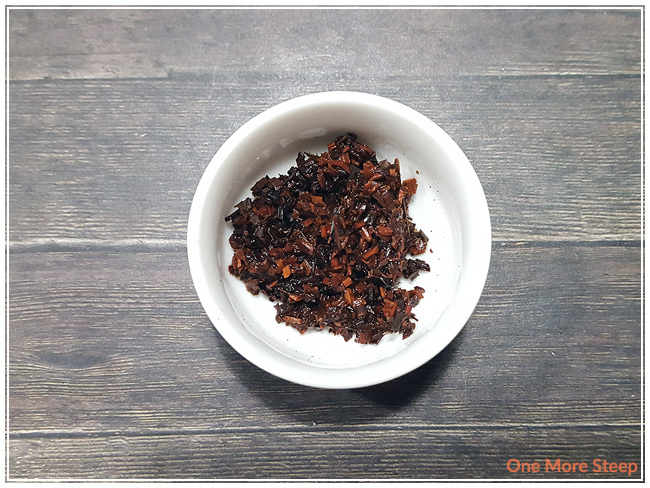 For A Dark Night Orange Spice Puerh, I resteeped it a total of 3 times (4 steeps overall). I found that the spice flavours in this puerh blend remain fairly consistent, but that the orange/citrus flavours kind of waned a bit too much by the 2nd resteep (3rd steep overall). Vanilla Latte Tea didn’t do that well with the resteep, I found that it lacked that delicious vanilla flavour that I loved in the first steep. I would say that Vanilla Latte Tea is good for one steep only. I did try to resteep Chocolate Hazelnut Dessert Tea and found that it was mostly the honeybush base than anything else with the second steep, so I would say that Chocolate Hazelnut Dessert Tea is good for one steep only. 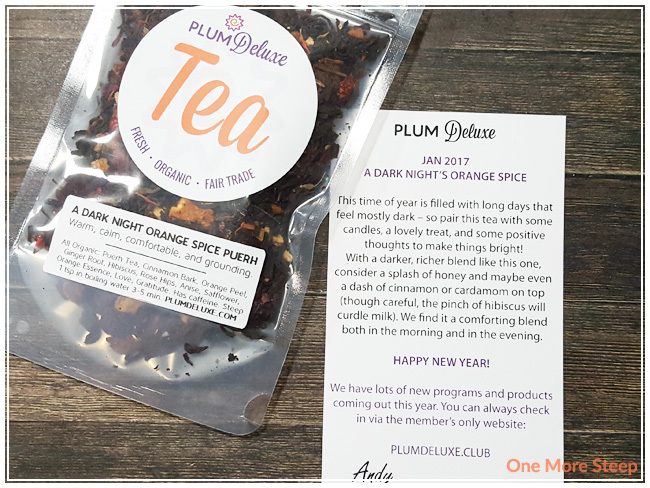 I loved Plum Deluxe’s January Tea Club shipment! I find a lot of tea clubs can be fairly expensive, but at $10-16USD, this one won’t break the bank. I’m a huge fan of getting things in the mail (especially tea!) so this was a fun experience. I like the fact that Plum Deluxe has created a website full of resources and has cultivated a sense of community among its tea club members. The packaging is great – simple, functional, and resealable (my favourite part, really, I’m a huge fan of keeping my tea from going stale). What I like is that the tea club gets you a special month blend every month, so it’s always keeping things interesting for all of the members. Surprise teas can get you out of your tea comfort zone and out trying new things, which is always fun. Of the three teas, I really enjoyed A Dark Night Orange Spice Puerh the best.